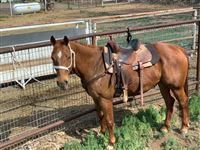 This gelding is as automatic as you could find. No alley issues, Point him in the right direction and let him make his run. Has almost never hit a barrel. 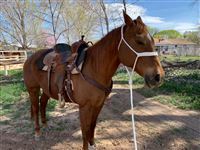 He has been hauled to numerous rodeos and barrel races. Easy to load, hauls easy. He is gentle and consistent enough for your 9 - 12 year old junior barrel racers. 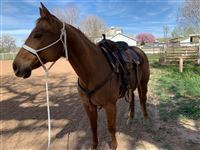 He is so consistent, you have the opportunity to earn points with every run in your jr rodeo series so your given the opportunity to win those buckles and saddles. Or could make a good junior high barrel horse. Legs are clean. Absolutely no known soundness issues.